An internationally recognized oceanographer, Evan B. Forde became the first African American scientist to complete research dives in a submersible when he journeyed miles underwater in the Nekton Gamma vehicle in 1979. An expert on the formation of submarine canyons, Forde explored the evolution of these striking geologic forms during multiple dive expeditions. More recently, Forde’s research examined how satellite sensors might aid in analyzing the connections between atmospheric conditions, specifically the moisture environment, and hurricane formation. Born in Miami, Florida on May 11, 1952, Forde spent his childhood in the city. His parents, Samuel and Margaret Forde, were both teachers and, from a young age, Forde had an interest in science. He owned a microscope, telescope, and chemistry set in elementary school and eagerly watched The Underworld World of Jacques Cousteau on television. In high school, Forde had the opportunity to take a course in environmental oceanography, which further piqued his interest in the undersea world. For college, he attended Columbia University in New York City, New York completing a B.S. in geology with an oceanography specialty in 1974. He then continued on to earn a M.S. in marine geology and geophysics, also from Columbia. In 1973, while still an undergraduate, Forde began his career with the National Oceanic and Atmospheric Administration (NOAA). The agency would go on to support his graduate studies as well with a fellowship. 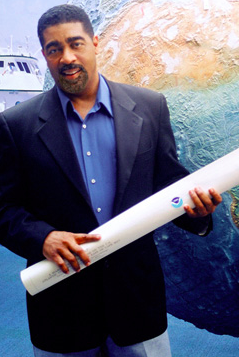 After receiving his Masters’ degree, Forde returned to south Florida to work at NOAA’s Atlantic Oceanographic and Meteorological Laboratory in Miami on Virginia Key. During these years, much of Forde’s research involved mapping the floor of the Atlantic Ocean. His explorations in submersible vessels, which began in 1979, took him deep underwater, to areas that had never before been studied by scientists. Among Forde’s most significant findings was the detection of a submarine sediment slide off the coast of New Jersey; this important discovery in 1980 eventually led to a cessation of offshore drilling by oil and gas companies in the area. Beginning in the 1980s, Forde’s research shifted to the area of ocean chemistry, including hydrothermal plumes created by underwater volcanoes. Later, his focus became satellites and their use in tracking hurricane formation. During his more than three decades with NOAA, Forde published numerous articles on marine geology and other topics. He also developed and taught courses for a wide range of students, from those at the graduate level to middle school. Forde has written science-centric material for many children’s publications, including penning a column for Ebony, Jr. Outside of the field of oceanography, Forde volunteers with local schools and sports programs and has taken a lead in supporting NOAA’s Equal Opportunity Employment (EEO) initiatives. In 2001, in recognition of his wide-ranging research and teaching interests, NOAA named Forde Research Employee of the Year. He has also been recognized as South Florida’s Federal Employee of the Year in the Service to the Community Category and received a Congressional Commendation (2008). Additionally, in 2009, both the City of North Miami and Miami-Dade County celebrated “Evan B. Forde” days in his honor. Most recently, in 2011, Forde was recipient of the prestigious NOAA Administrator (Under Secretary of Commerce) Administrator Award. Ray Spangenburg and Kit Moser, African Americans in Science, Math, and Invention (New York: Facts on File, Inc, 2003), 82 – 83; “Scientist, Educator, and Community Activist,” Evan B. Forde’s website, http://www.evanbforde.com/about.html; Mohamed Hamaludin, “Pioneering Miami Oceanographer Honored at NOAA Ceremony,” South Florida Times, October 20, 2011.